Cards Against Humanity has been a staple part of any young person’s laugh since its creation way back in May 2011. Just as the world started becoming more and more PC, eight students from Highland Park High School in Illinois had the genius idea to throw caution to the wind and allow people to delve into the deepest and darkest corners of their minds to form sentences that cause the most offence in order to win a pretty basic card game. Since then, pubs and bars all over the world have run Cards Against Humanity nights. Groups of friends have banged out Cards Against Humanity at pre-drinks and dinner parties to entertain themselves. And the company? Well, the company itself has grown and grown and grown. As with any growing company, it stops being a few mates having a good time and soon becomes several departments working in some sort of unison to create profit. Only, Cards Against Humanity haven’t become boring and corporate in departments like advertising and marketing. In fact, they’re the polar opposite. So much so they’ve decided their latest stunt will involve annoying the most powerful man on the planet, the President of the United States of America, none other than our favourite orange toupee-wearing leader of the free world, Donald J. Trump. How are they going to annoy ol’ Trump? Well, they’re not going to take the dictator’s approach and persistently threaten nuclear war. Even that’s a bit too far for Cards Against Humanity. Instead, they’ve decided to buy up a plot of land currently vacant on the border of the United States and Mexico making it extremely difficult for The Don to build that super-expensive and wildly unnecessary border wall he is so desperate to build. Donald Trump is a preposterous golem who is afraid of Mexicans. He is so afraid that he wants to build a $20 billion wall that everyone knows will accomplish nothing. So we’ve purchased a plot of vacant land on the border and retained a law firm specialising in eminent domain to make it as time-consuming and expensive as possible for the wall to get built. 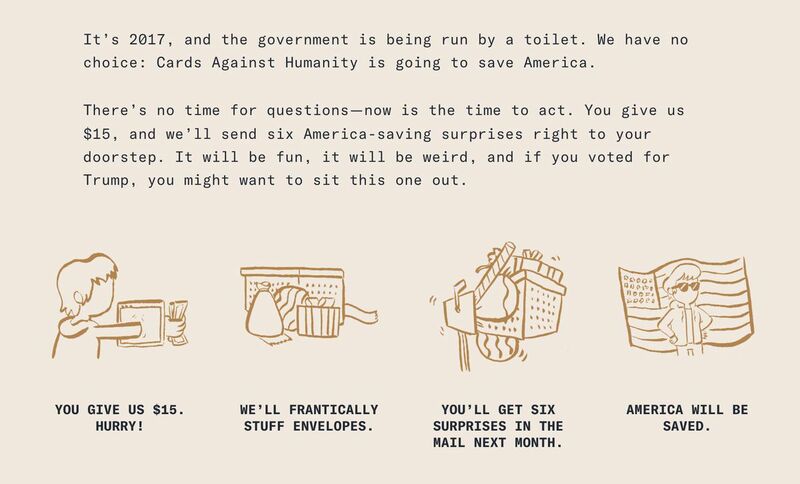 As with anything Cards Against Humanity, they’re asking their fans to help with the costs and are asking people to fork out just $15 to receive ‘six surprises’ in December, an illustrated map of the land, a certificate to fight the wall and some new cards for your set. Given the general nature of the game, and the fact they are completely self-owned, they can pretty much get away with what they want. They’re only there to cater for their fans. There are no corporate interests. I don’t like that you’re getting political, why don’t you just stick to card games? If Donald Trump thinks this is just some publicity stunt, he’s barking up the wrong tree. Cards Against Humanity are on the US-Mexico border and they have no intention of going anywhere. We fully expect this to rumble on.